I am located just east of Washington, DC, just off the beltway. I don't have a problem commuting to the scene of the missing item even if it is a bit of a trek. We will work something out. Just a small $20 call out fee within 30 minutes of zip code 20721. Anything further and we will discuss an appropriate compensation for the time and travel. I do not formally charge for my detecting services beyond the call out fee, but I will graciously accept any reward as deemed appropriate by the jewelry owner. Ring Finders typically work on a ‘Reward Basis’ only. If you need my service in locating a property marker, lost tools or hardware, I charge the standard $20 call out fee plus $30 per target identified. If we don’t find anything, please just cover the call out fee. Again, please let me know if you have any questions. I’ll search just about anywhere! Sand, grass, woods, snow, leaves, etc! If you have a decent understanding of where the ring or article was lost, then we’ve got a good shot at finding it! I’ll even search in shallow water, up to about waist deep. Unfortunately I cannot dive, so I simply can’t help with any underwater recoveries. I’m sorry! Other things to take into consideration: A metal detector is a very sensitive machine. It locates small metal targets in areas where there are no other metal targets to interfere with the search. What this means is I can’t search a car or inside a house or in the trash. The metal detector would beep constantly, thusly making it useless in locating the lost item. If you have any questions whatsoever, please call me and I’d be happy to help. If I don’t pick up, please leave me a message or a text message right away so that I may assist you as soon as possible. I am available to search for your missing item in the evenings or on weekends. If you are very local, I can often peel away quickly on a weekday to try to locate your item! I’ve been metal detecting for over 15 years, and treasure hunting since I was old enough to walk. I have used almost every different manufacturers’ machines and will use my experience to do everything I can to find your lost item. Finds have been many over the years. Rings, coins, tokens, buttons, bullets, and hundreds, maybe thousands of pounds of trash. 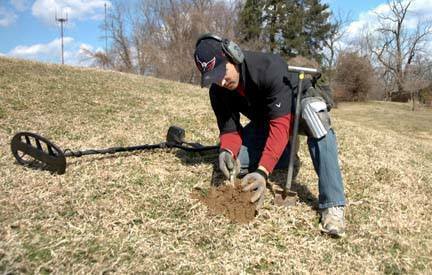 We clean up all trash and dig in a careful manner so that grass or turf is not damaged. I have multiple metal detectors and will gladly bring a second detector to the hunt site if you want to join me. I would be pleased to give you a tutorial. Metal detecting is a wonderful, healthy hobby, and I would encourage you to give it a try!